An old house built for a Sea Captain in the 1870s once sat on this property in the historic village of Edgartown on Martha’s Vineyard. When it was deemed “unsalvageable,” the owners hired Patrick Ahearn Architects to design a convincing replica to sit in its place. Take a look and see how the new version of the old house turned out! In a staid neighborhood known for its ubiquitous shutters of near-black “Edgartown green,” the shutters at No. 86 were a lively go-to-hell blue. The High Street façade was so bold as to sport a bay window. 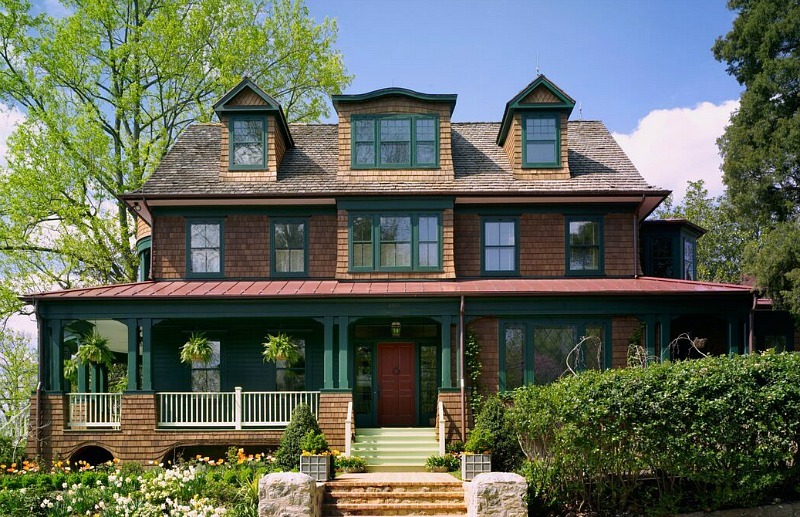 It had front entries on two sides, one of which used to be outfitted with one of those Victorian follies – a porch. There are 4 bedrooms and 4 bathrooms. “The spirit of the original house has been articulated through a series of interior details that speak to the language of the Greek Revival Farmhouse vernacular, albeit in a more modern interpretation,” the architect says. The new Captain’s House has 3,352 square feet. Isn’t she a beaut? For more information, visit Patrick Ahearn Architects (photo credit: Greg Premru) and read a story about the original house here. Stunning — but did you see the tile counter tops in the kitchen? Yes, I saw that! I can’t imagine why they’d choose tile! A gorgeous house nonetheless! They did a great job! I wish more people would pay more attention to the little details like the cornerboards and the types of windows they install. Many houses could be made a lot more attractive. Beautiful! I just love it and would live there in a second. (I’d have to paint the shutters (and maybe the living room built-ins) Edgartown green, though. Not a fan of that blue. But does it have a Monkey Puzzle tree? The entry way so reminds me of the old movie, “The Ghost and Mrs. Muir” with Gene Tierney. I loved the sea captain’s house in that movie! absolutely stunning love the colors love the house! But the tiled counters have to go. I find the tile refreshing for a change. Does every kitchen have to be marble or granite? Some of favorite kitchens are in cottages in California, and many use tile (or don’t rip it out if it’s vintage). Love the tile countertops, but wish they were in blue, rather than drab beige. Everything else is good too. Kudos to them for building something that looks like it belongs there, rather than some modern monstrosity. I am just in love with that bathroom tile!